AN OLD city depot site about a third the size of the Botanic Gardens is to be turned into an forest - complete with wetlands created from stormwater - the State Government says. The triangular 5.5ha site in Thebarton is bounded by East Terrace, Port Rd and the railway line, and is occupied by an SA Water depot. Premier Mike Rann said the Government had decided to return this area to the parklands when SA Water moved off the site in the next few years. Mr Rann today inspected the degraded SA Water depot site with new Federal Opposition Leader Kevin Rudd. "Not only are we giving back parklands for the first time in more than a decade, they now come under tough new protections contained in the Government's Parklands Act which officially became law yesterday." "Like me, Kevin Rudd is committed to reducing greenhouse gases and doing all we can to reduce the effects of climate change on our environment," Mr Rann said. "The combined impact of SA Water's relocation to a new six-star green building in Victoria Square and the plantings in the urban forest will eventually result in a reduction of 405 tonnes of C02 gases per year for the next 30 years. This is equivalent to taking 110 cars off the road or the emissions from 60 households. The plan was to create a contemporary woodland park setting using indigenous species and sustainable landscape principles, he said. "It will be a safe place that the public can enjoy, through a variety of amenities powered by renewable energy, through solar lighting and a wind generator, and all water will be collected and re-used on site. "It will be designed to provide a variety of habitats for local native fauna. There will also be a new section of bikeway that will link the Westside Bikeway with the River Torrens Linear Park. When used with the Coast Park path between Henley Beach and Glenelg it will create a 20km-long off-road recreational loop, he said. Those east of the city will be able to travel from Athelstone to Henley Beach, Glenelg and back to the City via the Westside Bikeway and then returning back to Athelstone. This will create a 70km cycle path, almost entirely off-road. The site is expected to be completed and returned as parklands in 2009. That's great to hear! Would be nice to have some decent cycle paths that side of the city. Will wrote: "The combined impact of SA Water's relocation to a new six-star green building in Victoria Square and the plantings in the urban forest will eventually result in a reduction of 405 tonnes of C02 gases per year for the next 30 years. This is equivalent to taking 110 cars off the road or the emissions from 60 households. I like Media Mike, but comments like these are just rubbish. To put that 60 household reduction in relative terms, that's a 0.015% reduction in household C02 emissions (based on 400,000 households in Adelaide metropolitan area). Nice to see the site rehabilitated though. Adelaide Parklands Trail - new and improved! I am an avid cyclist and frequent user of the Parklands and all the paths and trails within. Does anyone else here ride/walk/run the parklands? Re: Adelaide Parklands Trail - new and improved! The current bike track which was finished about 8 months ago, goes from the BMX track in the South parklands (Pulteney St) and winds its way through the south-east parklands to the North/East Tce corner (Botanic Hotel). Its the track with the red bitumen. Its fantastic. I ride my bike everywhere and travel on this track once a week caus its so nice. Its so green at the moment and if you travel just before dusk there are hundreds of galahs, cockies and kookaburras out and about. The parklands around the East/South Terrace area have no roads going through it and with so many trees you cant even see, hear cars or see any buildings. Its just great. 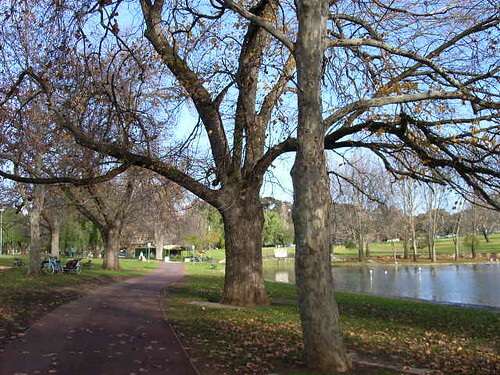 The next stage I gather is to extend it from Pulteney St through the south parklands to connect with the west parklands. There a few existing tracks now but they're are all over the place and no direct route, cant wait till its finished. Yep.. my wife and I love riding down there. Haven't been since it's been raining but can't wait to do it again. Guys.. i highly recommend going to City Bike and taking advantage of the 2hr free bike hire on the w/ends. I havent been bike riding in ages, should try and get down to the city soon and hire a bike. Will this loop eventually go along the Torrens, or right up around the top of North Adelaide? I ride the southeastern part regularly to and from work, and it is a beautiful ride. I'm coming back down for a holiday in a few weeks so I'll definitely have to check this track out, thanks for the heads up! Theres plan to have a esplanade cycling track from North Haven right down to Seaford or Sellicks Beach. Should become a awesome attraction, once complete. crawf wrote: Theres plan to have a esplanade cycling track from North Haven right down to Seaford or Sellicks Beach. Last edited by jk1237 on Tue Jul 03, 2007 9:51 pm, edited 1 time in total. haha, let me try that again, did that pic work for you all now?